In Afghanistan it is not uncommon for parents to give their daughters, sometimes as young as 10 years, over to marriage in order to settle debts or resolve family and clan disputes. It is estimated that in the developing world, 1 in every 7 girls married before her 15th birthday. In hard times, it can save a girl from a life of poverty and hunger. This practice is deeply entrenched in Afghan culture. According to Unicef, 57% of Afghan marriages involve girls under 16, while 80% are forced or arranged. Some girls hold on to their toys durring the wedding ceremony to mostly far older men, who ar regularly over 60 and whom they meet for the first time at their wedding. 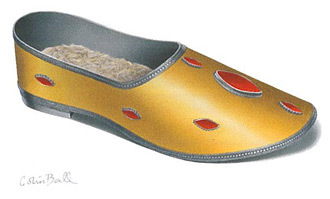 The fire-gilded silver wedding shoe shown here is adorned with carnelian gemstones and a turquoise heelpiece. Raw wool is used as insole material.